The Italian principal flute Silvia Careddu learned today that she had failed her regulation two-year trial after one year and five months with the Vienna Philharmonic. Silvia, one of a dozen women presently in the orchestra, gave a stellar performance during the New Year’s Day concert three weeks ago and was generally well liked across the ensemble. But certain players in the wind section had reservations (we hear) about her timing, and their view apparently prevailed in the vote. Other players have told us they are very disappointed. There was no question about her sound, which was universally appreciated. Silvia, 41, will leave the orchestra at the end of the season. She was previously principal flute of the Wiener Symphoniker. Although appointed by the Vienna Philharmonic in September 2016, she did not start to play until her predecessor retired in August 2017. UPDATE: We hear that the principal of almost every section in the orchestra voted in favour of Silvia, but they were outnumbered. The absence of one player is thought to have made the difference to the final, tight result, denying Silvia the two-thirds majority required. Quite. People cannot advocate democracy and then complain when it happens to turn against your preferred politics. It’s not conditional upon only electing your own preferred result, and who’s to say that another woman flautist may not be her replacement? Too bad – we enjoyed her playing on the VPO’s New Year’s Day b’cast. One wonders how much the vestiges of anti-women sentiment in the orchestra are responsible. You’d first have to explain away the fact that Karin Bonelli (Flute) and Sophie Dervaux (Principal Bassoon) passed their trial phases with flying colours and received membership in the Wiener Philharmoniker without any issues. Karin is Austrian & I don’t believe Sophie has passed her trial yet. She passed her trial last year. It is ridiculous. However, if you want to feel better about the VPO then read the blog about the Ulster Orchestra! I say the next candidate must be transgender. The myth of the gender binary is destroying music! Well then you should apply for the vacancy! All you have to do is insist that you are some gender that is not indicated by your external genitalia and you should be a shoo-in. (Since they have started accepting women, skill is obviously no longer a consideration. Owning a flute might be helpful, but is probably not necessary.) Go for it! Make history! Do you take a perverse pride in being a bore? It’s not an accomplishment, you know. Just like the two party system is destroying American politics? Isn’t it a bit dangerous to open the vote to Sub-principals, Tutti players, etc., since their approach to orchestral team-playing is necessarily different to that of Principal players? i.e. leaders vs followers? Logistically there are going to be more of them than Section Principals, so it seems to me like taking democracy a bit too far. Everyone is equal in the VPO. And I believe that in most orchestras where a decision goes beyond the audition committee, it’s usually one person, one vote. Oh dear. You don’t play in any orchestra, do you ? It’s the same for trial voting. The whole orchestra votes and 2/3 majority is needed to succeed. In both cases the section with the vacancy/candidate and the remaining orchestra vote on ‘separate ballots’ if you will. On an aside, what can be difficult for some is the fact that in many orchestras here, a simple majority is required to win the audition but a 2/3 majority is required to gain membership. Section (or “tutti”) players can have just as much artistic discernment as principal players, and may have more insight than a principal into whether the person is a good leader. And principals are capable of being just as petty, arbitrary, vindictive and unreasonable as anyone else. Hmm, perhaps the “followers” are the ones best qualified to judge the leadership qualities of the principals…? There were no Tutti players present. The Jury is made up almost exclusively of principal players, the only exception being that the entire flute section was of course invited. Otherwise there are only principals of sections involved in the decision making process. Thank you for this important clarification. Anyway who would want to stay in an orchestra where 2/3s are against the player remaining in the orchestra? According to the update above, it was allegedly a 1 vote margin that denied her a two-thirds majority to remain in the orchestra, so your claim that two-thirds were against her is wrong. If the above is correct, then in fact barely one-third were against her, not two-thirds. That is correct. A two thirds majority is required for her to be accepted. She missed that by one vote. I believe you have it backward: She needed 2/3 YES votes, which she almost got. She was one short of a two thirds majority, not a one third majority from what I can see. Seems very unfair. And gender has nothing to do with it. Would be tough on anyone to have 66% of the vote and still lose your job. To get tenure in Vienna, a 2/3 majority of the players is needed, i.e. you do not get tenure if more than 1/3 of the permanent members vote against you, even though you may well have the majority of the orchestra behind you. If the report above is correct, which is not an unimportant caveat, she missed the required 2/3 majority by one vote. This means she had the majority of the votes, but it was not a sufficiently big one. From this basis beginning to speculate about her wanting or not wanting to play in a place where 2/3 of the players are against her remaining, shows a somewhat doubtful understanding of simplest math. Ridiculous! Silvia is an incredible player; what are they on about? As we also await the “it was better in the old days” and “I don’t see gender” crowd. Is she out of the opera, too? I thought Daniel Ottensamer was Principal Flute? Haven’t seen him around lately, either. She seemed more than qualified to me and a great player to my little ears. Nonetheless, writing that: “There was no question about her sound, which was universally appreciated”, seems a bit over the top. If approximately a third of the Orchestra voted NO to tenure, disappointment over sound might be a sentiment held by one or more of the Naysayers and certainly cannot be rejected out of hand. Question: She was denied tenure in the VPO. But doesn’t she remain (or at least have the option to remain) a member of the Staatsoper Orchestra? As people often point out, the VPO is a private club; the Staatsopera a public institution. Presumably the private club doesn’t dictate one’s status in a public entity. Wondered about that. The tuba player who was denied tenure with the Philharmoniker left and eventually got the Cleveland Orchestra job. The Staatsoper can only have so many wind players so I wonder what happens. So far, as I understand it, she remains a Principal Flutist in the orchestra of the Wiener Staatsoper. Very surprising. Ms Carredu absolutely stole the show on New Year’s Day. The cameras certainly followed her a lot during the telecast and captured numerous shots of her smiling and beaming with evident pleasure. And she does throw herself into her performance with almost exaggerated rocking motions while she plays, which also captures the eye and draws attention. Perhaps for some members of the orchestra it was too much attention to someone still on probation? The epidemic of superfluous theatrical gestures in instrumental performance (“bobbing for apples”, “tap-dancing”, etc.) is a serious problem which should be addressed more often. Unfortunately many otherwise quite accomplished musicians have fallen prey to this trend, which is a symptom of the pernicious visuals-first culture to which even music has surrendered. Teachers are actually training their students in this bad habit and the results, alas, are audible. Stealing the show is unfortunately not a priority in VPO, or most orchestras for that matter. In VPO, where conformity and fitting in is critical “stealing the show” would probably cast doubts on her ability to fit in seamlessly with the ensemble. She also didn’t really steal the show unless you were a male viewer.You noticed her because she’s attractive. She did her job. They didn’t show her in several of her big solos. Yeah, when I’m watching Berlin, I always think that Andreas Ottensamer and Emmanuel Pahud steal the show. The truth is that they’re just really good looking men doing their jobs but as a normal red-blooded woman I notice them more. “Reservations about her timing”. What does this mean ? Most often that would mean that a person’s rhythmic sense is lacking. Lagging or leading on one, uneven eighths, and the such. Jealousy has destroyed a great many wonderful artists. Or at least envy has. I’m curious as to why mainly section players weren’t so impressed. I heard her on the New Year’s concert and had some mixed feelings. Nice tone, yes, but I felt it didn’t match the section all that well. Still, I thought she played well enough to keep that job. I’d have to hear in something more difficult, such as Debussy. I find it odd that the principal players did not object to her ‘timing’. If there really were such an issue, certainly they would have been the first to complain. I’m dying to know exactly what that particular complaint is supposed to mean. Actually, I have no comment about this. The VPO is hiring women at a rate close to international norms (unlike orchestras such as the Berlin Phil.) And women are now about 10% of the VPO. At that point, minority groups begin to form a group identity and stand for their own interests. Little outside help is needed. The El Pais article notes that the top ten orchestras in Gramophone’s rankings all have Asian members except the VPO. And in spite of the fact that about a quarter or more of the students at Vienna’s University of Music have been Asian for the last 40 years. The VPO says there has never been an Asian good enough to be accepted. I would also caution readers to view the thumb symbols on this site with caution. If one uses an identity cloaker in a browser like Chrome (which can be turned on with just two mouse clicks,) one can vote repeatedly on the same comment by simply refreshing the page. I suspect the ballot boxes here are thus sometimes stuffed. It has ironically become a badge of honor to be pilloried in comments here, since the comments section of SD has become known as the “Breitbart of Classical Music” — though one might add the Fox News, MAGA, Brexit, BNP, and AfD Vaterland crowds. One wonders why classical music draws this mindset. And forgive me if I ignore them. Well said William. Sometimes we agree, sometimes we disagree, but your opinions as expressed here are always well reasoned and informed. By the way, mum wants to know if you can pick up some milk on the way home. It’s not that uncommon for players to not pass their trials. Often better positions await them. Sophie Dervaux, principal bassoon, who must be close to the end of her trial with VPO; didn’t pass her trial with Berlin on contra. She’s landed a much better job because of it. It was the scandal of the century a few yrs ago when Jasmine Choi didn’t pass her trial for Principal Flute with Vienna Symphony. Silvia Careddu was the one who replaced her. Berlin has a particularly rich history of not passing players after trial. Sabine Meyer might be the most famous. She went on to a successful solo career. Virginie Reibel didn’t pass her trial as piccolo with Berlin and now is one of the most highly regarded players in Spain’s Les Artes Orch. In the US as I recall David Buck didn’t pass his trial with LA. He promptly won Principal Flute with Detroit. Demarre McGill and various others didn’t pass at the MET and have lived to tell the tale. Perhaps the most stunning comeback was Alex Klein winning a major Princ. Oboe position in Canada almost immediately after not passing trial in Chicago. The best musicians are resilient and strong and will make a situation like not passing trial work to their advantage. Demarre McGill had the MET principal flute job as a one-year gig while someone who had left (Denis Buriakov?) was testing out a new job. Then he didn’t win the audition for the permanent job; it wasn’t a tenure thing. Then he went back to Seattle, which had been holding his job open for a couple years. It’s true, though, that many people denied tenure end up in other jobs – sometimes better ones, sometimes not. Maybe it doesn’t. But he landed on his feet and Silvia will, too. Anon’s point, I believe, was when people don’t get tenure, they often turn right around and win another job somewhere else. He (?) didn’t say Calgary was a better job, or even as good; simply that it’s one of the major Canadian orchestras, which it is. (If you think Toronto and Montreal are the only “major” Canadian orchestras, then you probably think there are only 5 “major” American ones.) Nor did he make any such comparison about LA vs Detroit. Hard to imagine how Careddu could find a so-called “better” orchestra than the Philharmoniker; however, it is not AT ALL difficult to imagine finding a job where she would be happier. I find it amazing that some people seem to know better and comment as if they where there during rehearsals/trial year(and a half) etc…but they actually don’t have all the facts! If so many people decided she is not the best fit for the orchestra….there must be for a reason…i am sure not only men had a vote in this! And if you mean that for women is not easy to be a part of a orchestra these days….at that level, it’s not easy for anyone! She is a great flutist, but just maybe this wasn’t her place to be….and not because she is a woman or because she is not austrian….but maybe there is more behind the story here! Sounds like someone had a real beef with this person. I am sorry, but this article is not factual. I am a Musician in German professional orchestra, and I have a colleague who studied in Vienna and also in musician world, everyone knows, that Vienna Philharmonic Orchestra has their own tradition by voting, if a musician can stay or has to go after the trail. In Vienna Philharmonic, every musician has the same right as everyone else the Orchestra. That means, the vote of a flute player has the same right of the vote of a tutti violinist. Unlike other orchestras in Europe, In VPO, there is no discussion whatsoever during the vote. So in the article and I quote, “But certain players in the wind section had reservations (we hear) about her timing, and their view apparently prevailed in the vote.” That cannot be done! If he/she is so perfect, all other members will prevail the view of “certain players in wind section”. 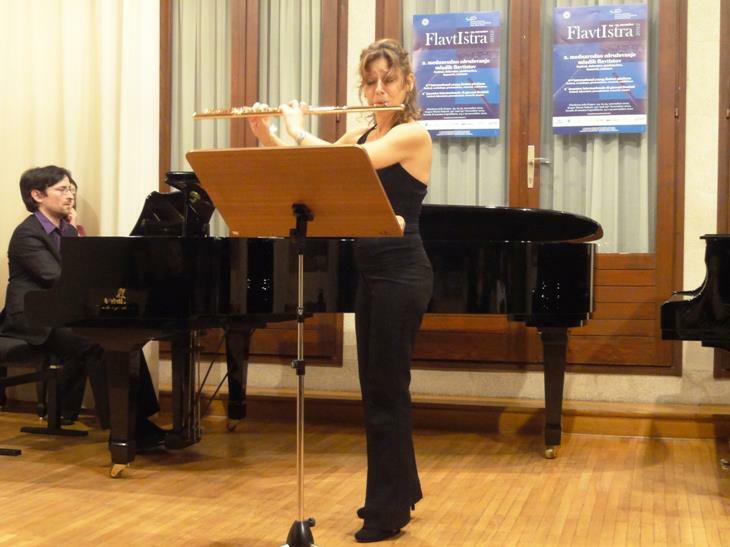 I am sure Silvia Careddu is one of the best musician and one of the best flute player! After two years in one of the best orchestra in the world, I am sure she will find a great job in other best Orchestras. She will not stay happy, if she got herself into the hostile situation in VPO anyway, as this article is trying to establish. I know the author is trying hard not blame sexism. But VPO has the own right to choose a member as they wishes. Even a female if they wanted to. So please stop trashing a wonderful Orchestra! Convoluted logic. You contradict yourself. More to the point, you imply that she was voted down because she wouldn’t be happy in the VPO. Does that mean that the VPO is looking for unhappy players? Re-read to yourself what you wrote, please. A sad state of affairs that when enjoying the VPO in performance (as we did recently in Vienna) one spends as much time trying to spot a woman amongst the players as listening to the music. Whether this state of affairs is borne of an unspoken prejudice (women perceived as being not as musically accomplished as men) or mere laziness after decades of male hegemony is open for debate but either way it is rather unsettling. There is something clearly in the VPO’s collective psyche which favours men and whilst I accept that the orchestra can’t suddenly make their existing male players redundant in favour of females it certainly seems to be taking a hell of a long time to redress the balance. Turnover is not that rapid, and the orchestra has more players than you see on stage. What you see on stage on any given night is not necessarily representative of the group as a whole. Personally, when I shell out the bucks for a ticket to see the VPO, I want to hear a group that sounds like the VPO. I’m not too concerned with the exact makeup of the group. If I want to hear (or see) a Viennese orchestra that has plenty of women who play well, there’s also the VSO, often in the very same golden hall. I heard her many times when she played in the Konzerthausorchester Berlin. She did well. However, passing the trial period in another place is a different matter. She was brave to take the risk of another trial. ITs a scandal! A shame! The VPO will not find a principal flute like s Careddu in the next 50 years! I live in Vienna and I am very close to the VPO and the Opera since 1970 and I can not remember something compareable.